Electric Motor Solutions is pleased to announced the introduction of the Model ECMDC75A series of DC Brushless Electronically Commutated Motors (ECM) to its product line. As a request with this announcement, we would be pleased to have your magazine publication include a short product announcement highlighting our new motor model series. The ECMDC75A Series of Brushless Electronically Commutated Motors (ECM) are designed for use in low voltage (12 to 48vdc) battery powered motor applications requiring Long Life, Low Maintenance, High Efficiency and Low Noise. The motor’s cost-effective and compact space saving design allows its use in various applications for single speed or variable speed operation. The rugged industrial class frame construction can be customized for single or dual shaft configurations and reverse rotation control operation. 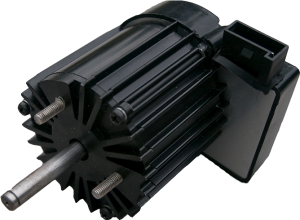 As a reference, I have included a High Resolution photo and a Product Data Sheet for the motor series. In closing, I would like to thank you in advance for your time and consideration of this announcement and I look forward to working with your company on other opportunities in the future.